Thinking Pinoy: #OustDuterte: Will Goldberg’s Plan Work? #OustDuterte: Will Goldberg’s Plan Work? A few days ago, the Manila Times reported that former US Ambassador to Manila Philip Goldberg outlined a strategy to oust the democratically-elected President Rodrigo Duterte from Malacañang. Will the 18-month ouster plan work? Economic Blackmail: limiting trade by some ASEAN member countries with the Philippines. Some may be inclined to dismiss MT’s report as a mere conspiracy theory. The problem, however, is that Goldberg has a history of undermining governments. In 2007, the United States was accused of funding opposition to Bolivian President Evo Morales by providing opposition leaders and critical think-tanks with millions of dollars [MT] through its philanthropic arm USAID. In 2008, Bolivian President Evo Morales declared Goldberg “persona non grata”. Morales eventually expelled USAID from Bolivia in 2013[BBC]. Yes, Goldberg did something like it not too long ago. Moreover, Duterte’s claim that US ambassadors are spies [CNBC] is not without merit, at least in the Philippine context. Goldberg himself was the United States Assistant Secretary of State for Intelligence and Research (US DoS INR) from 09 February 2010 [USGov] until 14 February 2014 [US DoS]. If “Intelligence and Research” doesn’t scream “Spy!” to you, nothing else will. And by the way, Goldberg was appointed Ambassador to Manila on 31 July 2013 [GMA], while he was still the US DoS INR head. Goldberg apparently didn’t waste time, as he got the ball rolling as soon as he arrived in Manila. In October 2013, USAID gave $24 million (Php 984 million) to the Philippines’ Gerry Roxas Foundation (GRF) [Star, USAID], purportedly to develop non-government organizations in the Philippines. Named after Liberal Party (LP) President Mar Roxas’ father, GRF is headed by Roxas’ own mother, Judy Araneta-Roxas, and among the members of the board are Maria Rosario “Charo” Santos-Concio and Marixi R. Prieto [GRF]. Santos-Concio was ABS-CBN’s CEO and President from 2008 to 2016 [Inq], and is currently its Chief Content Officer [ABS]. Meanwhile, Prieto is Inquirer’s chairman to date [Inq]. Nobody could have predicted Duterte’s rise to power, so the 2013 grant, at best, could have been Goldberg’s means to “pay it forward”, i.e. to gain the loyalty of LP and friends. And the financial gesture is now bearing fruit.Today, the Inquirer and ABS-CBN are the staunchest critics of the Duterte Administration, and both show a patent bias in favor of the Liberal Party [TP: Kill List; TP: Karen Davila]. I would like to expound more on this issue, but I think you already got my point, as the USAID’s gesture is in consonance with Point No. 4 of Goldberg’s strategy, and that it is all-too-similar to what Goldberg did to Bolivia. I believe Goldberg’s Seven-Point strategy can be implemented in 18 months. The problem, however, is whether Goldberg has the 18 months to do it in the first place. I have reason to believe that Goldberg prepared this strategy with the assumption that Hillary Clinton, a known proponent of “Humanitarian Intervention” [WaTimes], will succeed US President Barack Obama. For one, Clinton’s likely Pentagon Chief already started advocating for more bombing and intervention in as early as June 2016 [Intercept]. Humanitarian intervention is a euphemism for militarily coercing other states to get things done [Global Policy]. Well, everybody thought Clinton would win. That is, until Republican candidate Donald Trump rained on Clinton’s parade in November. Now, will Goldberg be able to convince a Trump-era State Department? FIRST: Unlike Clinton, Trump is predicted to be a generally inward-looking president, i.e. someone who is less likely to espouse Humanitarian Intervention [ATimes], when compared to the warmonger Hillary. SECOND: Goldberg’s career is too closely associated with Clinton and the Democrats [Star], a fact that the Republicans will surely detest. THIRD: Among other things, Clinton’s 2009 appointment of Goldberg as coordinator of the implementation of sanctions against North Korea, was detested by American Career Diplomats[WaTimes], so Philip may expect resistance from the Diplomatic Establishment. And there’s one major challenge facing Goldberg’s Strategy: Leni Robredo. Any ouster plot requires a suitable replacement to one who will be ousted. In this case, it should be Vice-president Maria Leonor “Leni” Robredo of the Liberal Party, and even LP’s “senior management” will agree that there is no other alternative replacement. After quitting the Duterte Cabinet earlier in December, Robredo’s net satisfaction rating plummeted a mere +37 in December 2016 from +49 the previous month [Star]. Meanwhile, Duterte’s satisfaction rating remained virtually unchanged at +63 in December 2016 from +64 three months earlier [Inq]. Now, imagine how the public would react if a +63 is replaced by a +37. It wouldn’t be pretty, to say the least. 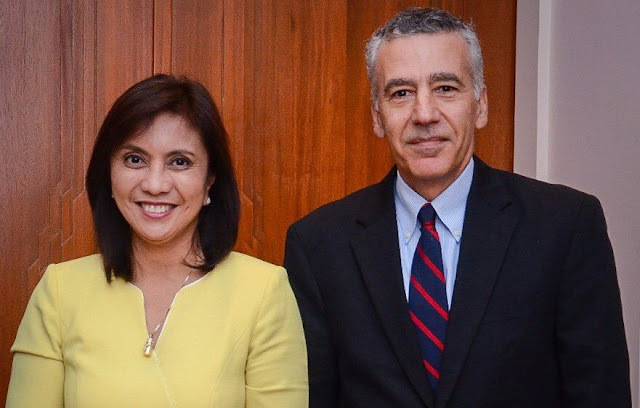 But it gets worse: Leni’s decision to take a vacation in the United States despite an impending disaster in her bailiwick is expected to exacerbate Leni’s popularity issue [TP: White Christmas]. This has led many to question Leni’s true character. Well, Leni was on the other side of the planet when Super Typhoon Nina was pounding the Bicol Region. And six days later, Leni has yet to release even a pre-recorded message to console the Bicolanos. Right now, all she could manage are tweets and written statements, messages that easily be created by her staff, who are probably busy doing damage control while their boss is missing. I am not sure if this is a swipe at Robredo’s obvious absence, but it sure appears like one. Well, you know the drill. We can expect Leni’s +37 to go down even further come the next survey period, because what she did during the holidays is far worse than anything she did before [TP: Thief in the Night]. To cut the long story short, the Filipino People will not accept Leni Robredo. I believe that Goldberg’s Seven-Point Strategy will not work because it lacks the three crucial elements explained in the previous sections. This does not, however, prevent the Liberal Party from attempting their last hurrah. Remember that LP’s most powerful ally, the US Democratic Party [TP: Trump], is still in power until the Republican Trump’s January 20th inauguration. That is, LP may still attempt a power grab before that date [TP: Plan 0117]. While I am confident that LP will still ultimately fail, I am also pretty certain that such a last-minute power grab attempt will be messy, if not bloody. But in this world, nothing is certain except uncertainty, so let us all be vigilant. Let us not allow these scheming elites take away our right to choose our leader. Our forefathers have sacrificed their lives so that we may be able to choose our nation's destiny. Because of their sacrifice, the government’s power now emanates from us, the Filipino People.